The Warriors went into this game hoping to get back on the rails after a poor performance and result at Airdrie the previous week. They welcomed back Colin McMenamin and Paul McMullan and therefore had a greater threat attacking wise than the previous week. Both made an impact in this game, and it was an improved performance but ultimately it was the same outcome as the Warriors lost the game and had a player sent off once again. In the opening exchanges the game ebbed and flowed at a decent tempo with both sides looking to get the first goal. The best chance though was in the 8th minute but ended with a comfortable save by Rab Douglas from McMullan. In the 13th minute a quick counter attack saw Ciaran Summers pick out Martin Grehan but the striker failed to get the ball past Douglas who had another easy save. At the other end a superb cross by Gavin Swankie caused problems in the home defence and they were relieved to see Omar Kader fire the loose ball over the bar. A minute later a free kick by McMullan fell to Ross McMillan but he failed to anticipate it getting to him and went out for a goal kick. McMenamin went wide in the 32nd minute from a Kieran Millar cross before there was a scare at the other end when Greg Fleming punched out an Iain Campbell corner, it hit Grehan who knew nothing about it and luckily went out for another corner. Nevertheless the half time whistle blew with the game still scoreless. It was not long after the resumption though before the deadlock was broken. In a quick build up a nice flick by Grehan set up McMullan who hit a fierce drive that could only be parried by Douglas and McMenamin was on hand to tap in from close range. Forfar responded with a Martyn Fotheringham free that went just wide. In the 52nd minute the Warriors had a great chance to extend their lead when a reserve pass by McMullan picked out McMenamin who was denied by a superb block save by Douglas. That was a key moment in the game as was the dismissal of Anthony Marenghi three minutes later for his second booking. The caution seemed harsh and it did have a major impact on the game. Brown Ferguson brought on Gregor Fotheringham to try and tighten up the midfield with Grehan leaving the field. It didn’t have the desired effect though as Forfar showed exactly why they are fighting for the title as the game progressed. Forfar took full advantage to step up the gears and Greg Fleming had to tip over a Darren Dods header. In the 71st minute Forfar equalised through Martyn Fotheringham who tucked away a Dale Hilson cross after the winger had exploited the space given to him down the flank. Hilson was beginning to enjoy himself as he imposed himself on the game and a minute later another run and cross caused problems but ended with Chris Templeman fouling the keeper. Hilson shortly afterwards saw a dipping effort parried by Fleming as The Loons tried to take the lead. Stenhousemuir were rocking at this stage and the game was being played more and more in the Stenhousemuir half of the field. It came as no surprise the way the game was going that Forfar took the lead in the 77th minute with Martyn Fotheringham once again being the marksman. The goal caused some ire in the Stenhousemuir ranks and support who were already smarting from the sending off as the ball appeared to be handled in the build- up. After a series of scares Stenhousemuir eventually conceded their third goal in the 93rd minute with once again Hilson being the supplier with Gavin Swankie tucking the ball home with the last kick of the ball. 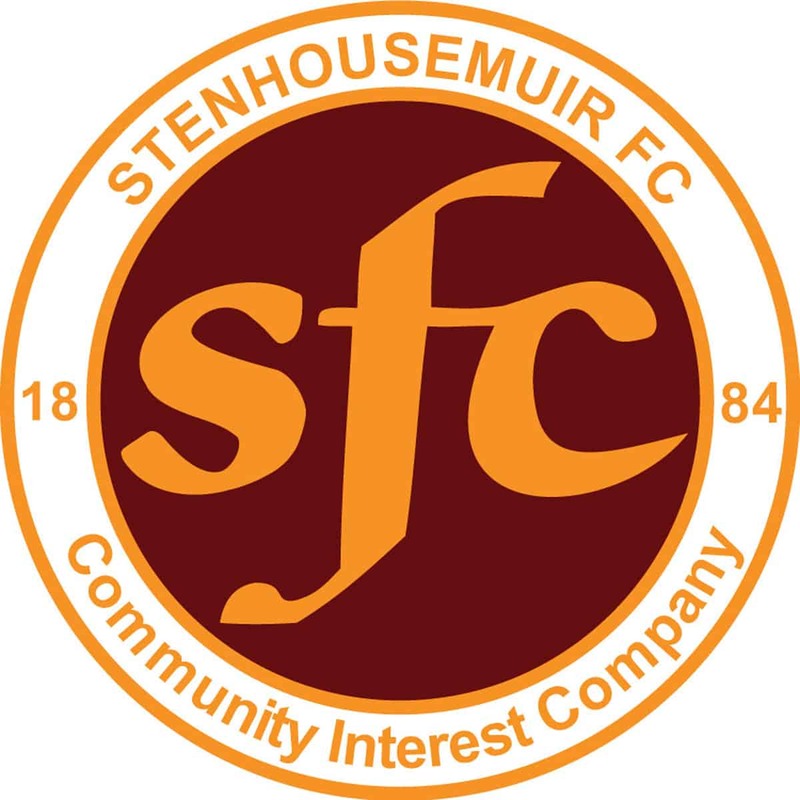 Stenhousemuir – Fleming, Meechan [b64], Summers, Lithgow, McMillan, K.Millar [Moutinho 84], McMullan, Faulds, McMenamin [b59], Grehan [Fotheringham 58] and Marenghi [b25][so55]. Subs not used – Duncan, Gallacher, Watt, Sutherland and Smith. Forfar Athletic – Douglas, Baxter [Dunlop h/t], Campbell, Travis, Dods [b68], Young [Husband 78], Kader, Fotherigham [Dale 88], Templeman, Swankie and Hilson. Subs not used – Malin, Kerr Denholm and King.